Fern Bank Cabin is a modern log cabin built in 2006, located on a ridge top to provide a spectacular view of the Shenandoah Valley. The screened front porch has a hot tub and an amazing view of the Shenandoah Valley. Fern Bank Cabin is our most private cabin. It's perfect for a couple or small family. The common area has vaulted ceilings, a real rock fireplace and chimney with gas logs. Above the fireplace is a 37" LCD HDTV with Dish Network and Blu-Ray player. There is a full kitchen and dining area here too. 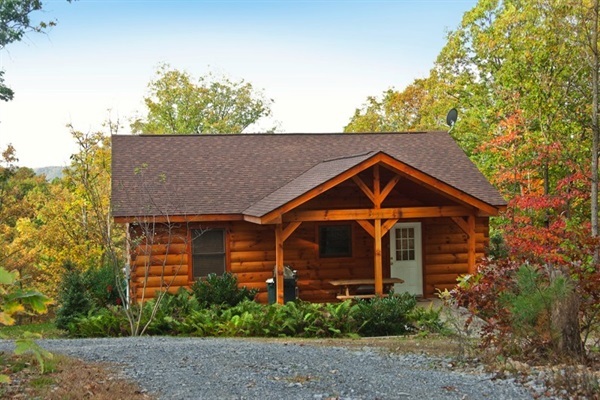 Fern Bank Cabin has two bedrooms, each with a queen bed and TV. There is one full bathroom with a jacuzzi tub. The back covered deck has a picnic table and grill. There is a fire pit outside, bring marshmallows and hot dogs! 50% required to confirm a reservation with balance due 7 days prior to arrival.